Let's make an arbitrary list of my favourite games of 2012. 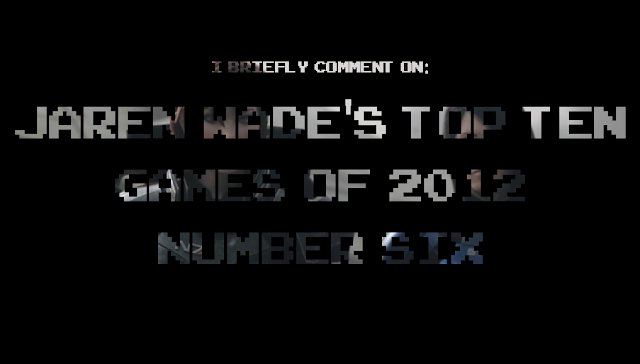 Here's number six. I’ve heard the phrase “It’s not about the destination, but the journey” thrown around a lot, especially when in regards to Mass Effect 3. Though the journey started back in 2007, my personal adventures with Mass Effect didn’t start until 2010. That year I played the first two games back to back, and adored my time with them both. Experiencing both titles in such a way made me realize how greatly developers BioWare were able to improve upon the original. It showed from the gameplay to the storytelling and its characters. I was fully invested in the narrative, and when I had finished I couldn’t wait for the story’s conclusion. 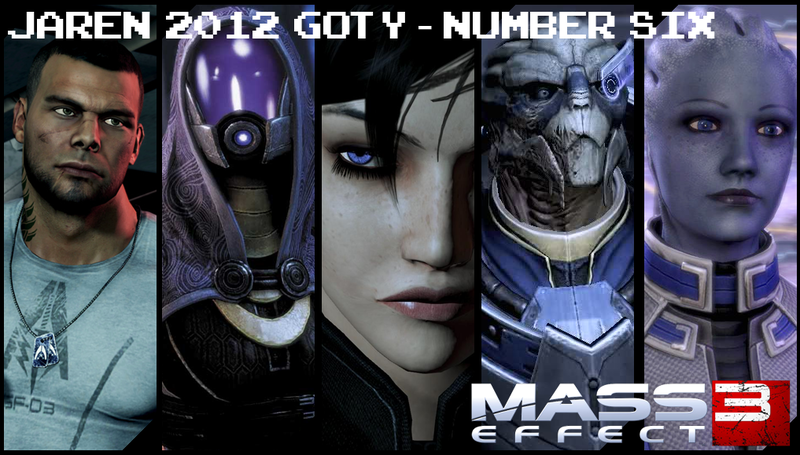 Mass Effect 3 is the accumulation of everything you went through during the previous two games. All the choices you’ve made and characters you’ve met return in some fashion. Their appearances range from full on party members, to quick cameo appearances and even throw away bits of dialogue. However small they were, I found myself smiling at every little nod and every single interaction that stemmed from the previous two entries. The gameplay itself remains the same after all these years. It’s still a mix of talking to NPCs using branching dialogue options and weapon based combat. The latter is as solid as ever, with it being now a finely tuned third person shooter that can stand on its own. This especially shows in the game’s multiplayer component. Mass Effect 3’s squad survival mode is a different take on the horde type modes that became popular this generation. Mixing in different objectives was a welcomed change of pace to just simply camping in a corner and hoping for the best. The different classes were fun to experiment with, and each presented a different way to enjoy the combat. Because of this, I actually wanted to switch classes once I had maxed out the level of the one I was currently using. It gave life to a game that I had thought I was done with, and what an extra life it was. My favourite aspect of ME3 had to be how it handled the returning party members. Character baggage and conflicts that were introduced over the span of the last five years also saw their conclusion. Considering that the loyalty missions for each of your squad mates was my favourite part of Mass Effect 2, seeing them return brought forth this nostalgic feeling. Having Sheppard interact with them again, and ultimately bringing an end to their stories produced a more satisfying one. Sure, there exists the fact that things wrap up almost too nicely, and the game certainly suffers from “the chosen one protagonist saves all” syndrome. However, it's a game that had to deliver a certain amount of fan service, and BioWare certainly got the job done. Plus there’s the fact that I found the conclusions to these side stories more satisfying than the game’s actual ending as well. And then there exists the game’s ending. Or at least, the ending I experienced back in April. Like many, I felt almost betrayed by the developers. While some may call that hyperbole, I honestly felt confused as the credits began to roll. After three games, an accumulative playtime that was well over a hundred hours and numerous decisions made, it all felt like for nothing. None of it seemed to matter as the ending was merely depicted by one final choice, a choice presented in a questionable fashion. However, this isn’t where the betrayal stems from. Player backlash towards the original ending was loud enough to justify the release of a downloadable “Extended Cut” ending. By the time of its release, I had long been over the Mass Effect universe and saw no reason to download it. A few more months went by, and so came forth another piece of Mass Effect DLC in the form of “Leviathan”. It was during an episode of The Giant Bombcast that I heard a first hand account of what both these pieces of content actually meant to the game. How a player experiencing the game for the first time towards the end of 2012 had a notably different experience than those who played it during release. Parts of the ending were retconned and more importantly, others were given additional context and justification. While I’m all for videogames supporting downloadable content, this was honestly the first time I felt that I had been robbed of a proper experience; a more complete experience. But hey, it’s the journey and not the destination. I could sit here and cry foul over the ending all I want, but the truth is that the time I had before the game’s conclusion was great. Seeing old characters and my old decisions come together in this grand finale produced a feeling that can only be achieved by investing so much into something for so long.